This event will start at 19:30 so in less than half an hour from now. Do we know whether we will be able to watch it from Germany? No idea, maybe the ZDF is broadcasting tonight? Máxima has some diamonds in her hair,can't see which ones And she is wearing a new dress. ARD is broadcasting til 19.50, then ZDF starts at 20.15. Right now ARD is reporting. ZDF will have something at 20.15, but I don't know if that will be live or just a documentary. It would have been much better if we were able to whole thing through NOS like every other person. Anyway, I loved the capes of little princesses. I love Ariane's reaction to the song... She looks like "why are we listening this... thing?" Who is the woman in red standing next to Maxima? The song is so beautiful, is that the song for the King? It was really amazing, but I heard the song received very bad criticism, or this is the newly made one? Máxima must be freezing btw. She is wearing diamond stars btw. Dress is from Jan Taminiau as well. 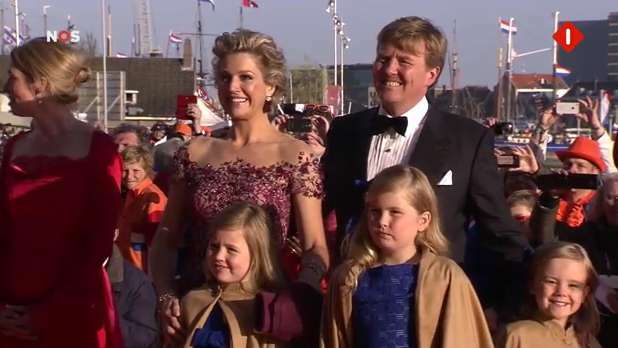 Still a pity that they didn't have the pageant on the Amstel river. Amsterdam Noord isn't exactly very attractive. It isn't the "King's Song", that was scrapped. Must be a new one if it was nice. That song was so bad it made UK news. So what song did they sang in concert for the King? It was the "King's Song". It is *that* song, after it was scrapped, it was said that that was unfair to the people who made it and that the previous complainers were just a small minority and than they brought it back..
Casa Real confirmed that Felipe and Letizia will be attending the festivities tonight. I think it is a summary of the day according to my TV Guide. Stefan, mine says : "Schiffsparade, Königsball, Krönungsnacht." So here's hoping.